What type of bugs do you see around your house? American cockroach adults grow to an average length of around 4 centimeters (1.6 in) and about 7 millimeters (0.28 in) tall. They are reddish brown and have a yellowish margin on the body region behind the head. Immature cockroaches resemble adults except that they are wingless. The insect can travel quickly, often darting out of sight when someone enters a room, and can fit into small cracks and under doors despite its fairly large size. It is considered one of the fastest running insects. In an experiment carried out at the University of California at Berkeley (USA) in 1991, a Periplaneta American registered a record speed of 5.4 kilometers per hour (3.4 mph), about 50 body lengths per second, which would be comparable to a human running at 330 km/h (205 mph). It has a pair of large eyes each having over 2000 individual lenses thus making it a very active night animal that shuns light. If you are seeing small to medium size (1/8 to 5/8 inch) light brown roaches in your home than they are most likely German roaches. This is the most difficult insect pest to exterminate that is found inside our homes. The best way to exterminate these pesky insects is a combination of pest control and homeowner sanitation. The best way to identify the German roach is by the two strips on it's head. The oriental cockroach is known also as a waterbug or black beetle. It can be found in all parts of the United States. The length of the oriental cockroach is about 1 1/4 inch for the female and about 1 inch for the male. Both have wings but cannot fly. The adults are dark brown and nearly black. The egg capsule is carried by the female for about 30 hours where it is either dropped are attached to a protected surface near a food source. The females will produce an average of 8 capsules containing about 16 to 20 eggs each and will hatch in about 60 days. Nymphs will molt 7 to 10 times and the stages usually take several months to a year to complete. The oriental cockroach has seasonal development cycles. The most number of adults usually appear in late spring or early summer. If nymphs have not reached their maturity by late fall or early winter, their development slows and usually don't reach maturity until early spring. 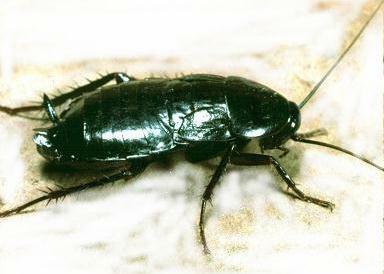 The oriental cockroach can be found in high moisture areas such as sewers and damp basements. They are usually located below ground level indoors. You probably won't find them on walls or high in cupboards or on the upper floors of buildings. Oriental cockroaches feed on all kinds of filth and other decaying organic matter. They can live for about a month without food but only about 2 weeks without water. In cold weather you will probably find the migrating indoors. Black Widow Spiders are considered venomous spiders in North America. Black Widow spiders are not usually deadly, especially to adults, because they inject only a small amount of venom. Despite its reputation, this spider often attempts to escape rather than bite, unless it is guarding an egg mass or if it is cornered and pressed. After mating, the female sometimes eats the male, earning the name "widow." The female black widow spider is the most easily recognized, her shiny black body giving great contrast to the red hourglass marking on her round abdomen. Adult black widow spider males are harmless, about half the female's size, and usually have yellow and red bands with spots on their backs. The legs of the male are much longer in proportion to his body than that of the female, with it's body half the size. Daddy-longlegs are fragile spiders, the body being 2–10 mm in length with legs which may be up to 50 mm long. Pholcus and Smeringopus have cylindrical abdomens and the eyes are arranged in two lateral groups of three and two smaller. Spermophora has a small globose abdomen and its eyes are arranged in two groups of three and no median eyes. Pholcids are gray to brown with banding or chevron markings. The shape of the Pholcus and Smeringopus's body resembles that of a peanut shell. eyes. Eight and six eyes both occur in this family. Like most jumping spiders, P. audax tends to prefer relatively open areas to hunt in, as they actively seek and stalk prey and do not build webs. They do use webbing when laying eggs or to hide. They also use spider silk as a 'lifeline' when jumping for prey or evading predators. They are common in fields and grasslands, but are frequently seen on fences, exterior walls, and gardens as well. Many jumping spiders seem to prefer flat vertical surfaces, likely due to the fact that it enables them to spot and chase down roaming insects with ease. You will also often find them in home hanging around your windows, looking for pry. These hairy little spiders are not harmful to people and try to avoid you too. The are a good spider to have inside as they kill other insects. The worker ants are about 3 millimeters (0.12 in) long and can easily squeeze through cracks and holes no more than 1 millimeter (0.039 in) in size. Queens are two to four times the length of workers. These ants will set up quarters in the ground, in cracks in concrete walls, in spaces between boards and timbers, even among belongings in human dwellings. Each worker is more courageous and harder worker than most ants. Creatures that attempt to prey on Argentine ants are confronted with an army of stubborn bugs that never runs from a fight! Most species of ants mate and reproduce by swarming; the Argentine mates in the colony, unexposed to the perils of birds, frogs, lizards, predator insects and extreme weather conditions. A swarmer reproductive has about 1 chance in 1,000 of surviving and successfully reproducing. The Argentine ant queen always succeeds! This ant pest has no natural enemies (of any importance) in the United States. These ants are not fun to play with, They Sting! When you see this ant "out and about" looking for food, you'll sometimes notice two sizes of ants. The worker ants are the smaller ones and the soldiers are twice the size of the workers and are fewer in number. While the workers are foraging for food the soldiers are protecting them and the colony. The soldiers have a tough life. While they spend their whole life fighting for the colony, thats all they CAN do. The soldiers, thou they can fight, they can't feed themselves, the workers have to do that too. Once a soldier get to old the workers simply stop feeding them and thats all she wrote, the soldier simply dies of starvation. But don't worry, there are alot more where that one came from. Now for some good news, California fire ants are easy to exterminate. These ants are not like the Fire Ants you would find in Texas. They are both fire ants but a different sub species. The picture of this BED BUG was taken by D.O.A. Pest Solutions' owner Anthony Matthews at a home in Bakersfield. Bedbugs are normally active just before dawn, with a peak feeding period about an hour before sunrise. However, they may attempt to feed at other times, given the opportunity, and have been observed to feed at any time of the day. They reach their host by crawling, or sometimes climb the walls to the ceiling and jump down on feeling a heat wave. Attracted by warmth and the presence of carbon dioxide, the bug pierces the skin of its host with two hollow tubes. With one tube it injects its saliva, which contains anticoagulants and anesthetics, while with the other it withdraws the blood of its host. After feeding for about five minutes, the bug returns to its hiding place. The bites cannot usually be felt until some minutes or hours later, as a dermatological reaction to the injected agents, and the first indication of a bite usually comes from the desire to scratch the bite site. Because of their natural aversion for sunlight, bedbugs come out at night. Although bedbugs can live for a year or eighteen months without feeding, they normally try to feed every five to ten days. Bedbugs that go dormant for lack of food often live longer than a year, while well-fed specimens typically live six to nine months. Low infestations may be difficult to detect, and it is not unusual for the victim not to even realize they have bedbugs early on. Patterns of bites in a row or a cluster are typical as they may be disturbed while feeding. Bites may be found in a variety of places on the body. The first thing to look for during a suspected infestation of bed bugs, is to look for blood stains on bedding, and pillow cases. If you see blood stains and unexplained bites on your arms and upper torso, chances are you have bed bugs. Now this is the fun part, THE INSPECTION. The infested room now needs to be taken apart. Bed bugs hide everywhere, of course the seams of the mattress, dresser draws, night stands and drawers, carpet, video games, clock radios, lamp shades, stuffed animals, and I could go on and on and on. Once the inspection is done, then the treatment begins. The treatment is an essential part of the process. The treatment will take sometime and will need to be continued until the infestation is eradicated. Earwigs, Pill Bugs, Sow Bugs, Spider Mites, Fleas,Ticks Crickets, Silverfish, Firebrats, Indian Meal Moths, other Pantry Pests, Mice, and Rats. All of these pests are in our community and there are a few more too!